American crime writing was reborn in the 1920s. After years of dominance by British authors, new American writers--with fresh ideas about the detective and the mystery--appeared on the scene and rose to heights of popularity not witnessed since the success of the Sherlock Holmes tales in America. Classic American Crime Writing of the 1920s--including House Without a Key, The Benson Murder Case, The Roman Hat Mystery, Red Harvest, and Little Caesar--offers some of the very best of that decade's writing. Earl Derr Biggers wrote about Charlie Chan, a Chinese-American detective, at a time when racism was rampant. S. S. Van Dine invented Philo Vance, an effete, rich amateur psychologist who flourished while America danced and the stock market rose. The quintessential American detective Ellery Queen leapt onto the stage, to remain popular for fifty years. Dashiell Hammett brings readers another mystery narrated by the Continental Op. W. R. Burnett, created the indelible character of Rico, the first gangster antihero. Each of the five novels included is presented in its original published form, with extensive historical and cultural annotations and illustrations added by Edgar-winning editor Leslie S. Klinger, allowing the reader to experience the story to its fullest. 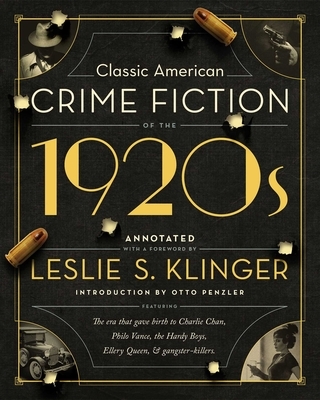 Klinger's detailed foreword gives an overview of the history of American crime writing from its beginnings in the early years of America to the twentieth century. This gorgeously illustrated volume includes over 100 color and black and white images as well as an introduction by the eminent mystery publisher Otto Penzler.